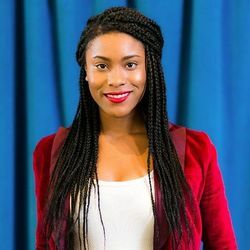 Denea Joseph is an illegal immigration activist and communications coordinator for the UndocuBlack Network, which is closely allied with NAKASEC. Zoe Ghertner interviewed Kamala Harris in L.A., at a charter school in Boyle Heights co-run by Homeboy Industries, the gang-intervention organization founded by Father Gregory Boyle. Harris has known Boyle, a revered figure in L.A., since her D.A. days, and Homeboy Industries later became a primary partner in her effort to bring Back on Track to other cities. Denea Joseph tweeted about President Trump on numerous occasions. "President Trump and his Republican party just shut down the government to advance their anti-immigrant agenda. Let’s be clear: this is the #TrumpShutdown. Call Congress and ask for the #DreamActNow! #TrumpShutdown #RepublicanShutDown #GOPShutdown"
"Trump is racist, xenophobic, islamophobic, sexist, and an agent of white supremacy. Therefore, his comments about Haiti and African countries as “shithole countries” are no surprise. It’s simply a reminder that he can say and do whatever he wants and remain in office." 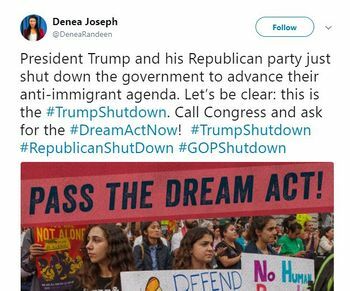 On September 5 2017, Denea Joseph tweeted that "ignorant Trump supporters" believe that DACA recipients receive federal aid for university tuition. This page was last modified on 18 August 2018, at 07:30.